You wouldn’t know it from looking at today’s youth, but it’s actually possible to live without electronic devices. I’m pretty sure that if you ask the average non-prepping teen what their most important survival need is, they’d either tell you their smartphone or their favorite social media platform. Even so, while they might suffer without being permanently plugged into their friends via Facebook and Snapchat, their hearts would keep on pumping blood (although at an elevated rate) and their lungs would continue to take in oxygen. But while it might be possible to survive without modern electronics, that doesn’t mean that doing so is desirable. While much of the electronics we use fulfill more of an entertainment role than anything else, there are also a wide variety of electronic devices which make life much easier to live. Some things, such as refrigeration and medical devices, can be considered almost critical to survival. Yet the power grid is the most delicate part of our expansive infrastructure, readily damaged by anything from high winds to much more serious events. While losing power for a few hours due to a severe storm isn’t all that big a deal, losing it for weeks, months or even years is. 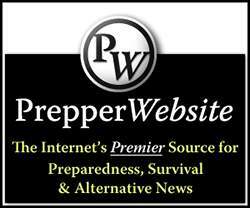 For this reason, many preppers work on going “off grid” at least to some extent. All means of off-grid power share one common flaw; they are unreliable. That’s not to say that they won’t produce at least some electricity pretty much every day, but how much electricity they can produce varies. There’s also the problem that they don’t produce any electricity at all when the right conditions aren’t being met. Solar power only works during the daytime. Even then, rain and snow can seriously reduce your electric power production. Wind power only works when the wind is blowing at least 10mph. Hydroelectric is actually more reliable, but few of us have a river running alongside or through our property that allows us to produce electric power by hydroelectric means. The solution to this problem of irregularity is to have some means of storing the electric power that is being produced. Then the solar or wind power system can charge that storage bank, allowing the power to stored for when it’s needed later. Hence, we have the need for a power bank. 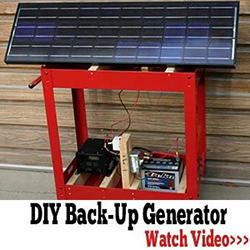 Most off-grid power systems are designed to work in conjunction with a 12-volt battery bank. In practical terms, this means they need to generate more than 12 volts of DC power, so that they can charge the batteries. Once the power provided drops below the nominal voltage of the batteries, they no longer charge. Solar panels, for example, typically produce a nominal 18 volts, helping to ensure that they are providing more than 12 volts to charge the batteries. Twelve volts is a convenient voltage, because the most common, least expensive, high capacity, rechargeable battery systems are 12-volt lead-acid batteries, such as those used in cars. While there are other, more efficient, higher capacity batteries around, such as Lithium-Ion, they are also considerably more expensive. What this means for you and I is that we can use used car batteries as the basis for building a battery bank. Any car batteries will work, regardless of size, and mixed sizes of car, boat and motorcycle batteries can be used together in the same system. As long as they’re 12-volt, they’ll get along just fine. All batteries are direct-current (DC) devices, which means that they have a positive and a negative pole or connection. Electricity flows out from the battery at the negative pole and back into the battery at the positive pole. Connecting two batteries together in series, with the positive pole of one battery connected to the negative pole of the other, allows the voltage of the batteries to be added. So two 12 volt car batteries connected together in series will produce 24 volts. Connecting three together will provide 36 volts, and each successive battery will add another 12 volts. 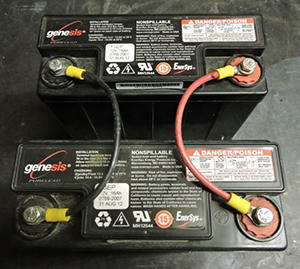 Two lead-acid batteries, connected in series. The other way we can connect these batteries together is in parallel, connecting all the positive terminals together and all the negative terminals together. In this case the voltage will stay the same, but the amount of current the batteries can provide is added together. So, if one car battery is able to provide 200 amps of power, then two identical ones in parallel would be able to provide 400 amps. Two lead-acid batteries, connected in parallel. There is a limiting factor on the amount of power batteries can provide, besides the batteries themselves; that’s the size of the wire used. For example, to carry 100 amps of power you need 4-gauge wire. If you don’t have wire that big, and try to pass that much current through it, the wire will heat up and eventually act as a fuse, burning out. How quickly it does that will depend on how big the wire is. However, there are very few needs for which you should have that sort of problem. While a battery might provide 200 amps of power storage, you will usually only be drawing off a few amps of power at any one time. The one place where you might have need of big wire is between the wire and the voltage inverter, but I’m getting ahead of myself. You can use whatever new or used car batteries you can find for a battery bank. Since we are going to connect them together in parallel it will be possible to connect additional batteries later, adding to the system. The only thing you want to do is to make sure that the batteries are still good, as a bad battery can short out the system, causing wires to burn. I’d like to note here that deep cycle batteries, sometimes called marine/RV batteries, are usually used for these sorts of systems. The reason for this is that they are not as easily damaged by what is known as “deep cycling.” This is where the battery is discharged more than 50 percent. However, normal car batteries can also be used. The only potential problem is that they might not last as long. However, this gives you the opportunity to make it out of used car batteries, saving a considerable amount of money. Batteries in a bank. Those on the left are used car batteries, the two in the center are new deep-cycle batteries, and those on the right are used lead-acid batteries I’ve scavenged from medical equipment. Please note that your car batteries will not be damaged if you avoid deep cycling; they will only be damaged if you discharge them beyond the 50% threshold. There are two other components you need to go with your batteries and the wire; they are a charger and a voltage inverter. You will need some sort of battery charger to top off your car batteries. What kind you use will depend on the power source that you want. If you are using the survival battery bank alone, without any sort of off-grid power, you can use a normal automotive battery charger, which gets its power from your home’s electrical outlets. The output of your survival battery bank is going to be 12 volts DC. You could connect any automotive charger to this, for charging cell phones and other small electronics. But if you want to use to power small home appliances, your refrigerator or electric power tools, you’ll need to boost the voltage to 120 volts AC. This is done through a voltage inverter. 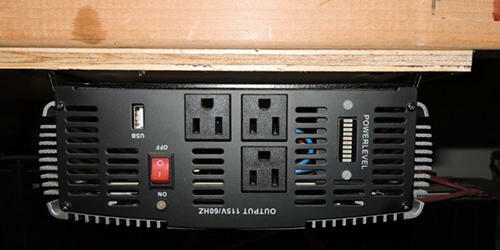 2,000 watt voltage inverter (mounted upside-down). The voltage inverter will come with cables to attach it to the batteries. These are large, because the way that the voltage inverter boosts the voltage to ten times what it originally is, is to use ten times the amount of current. In other words, if you are connecting something that draws 5 amps, like a refrigerator, the voltage inverter will need to draw 50 amps from the batteries. Therefore, it would be a good idea to use the same size wire for the jumpers between the batteries. One important note about voltage inverters: They are rated for both continuous output and peak output. Some manufacturers will advertise the peak output, rather than the continuous. Be sure to buy one where the continuous output is more than you need, as it can only operate a few minutes at a time at peak without causing damage. The entire system is connected together in parallel. 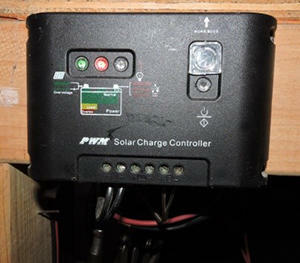 That means the positive output of the solar charge controller is connected to the positive terminals on the batteries and the positive lead entering into the voltage inverter. Likewise, all the negative leads are connected together. To make this easier, I manufactured two terminal strips out of ½” square copper bar stock. All this required was drilling and tapping ¼”-20 holes every ½ inch through the length of the bar stock (6” long) and then mounting it to a plastic base for insulation (the base is white). I have two strips, as shown in the picture above; one marked in red for positive connections and the other marked in black for negative connections. Positive terminal strip; the negative one (to the left) is identical. An important thing to consider is how much power you will actually use in an emergency. The only way to determine that is by looking at how much power your “critical” electronics draw. Don’t think you can power your whole house from this sort of system, unless you’re going to build a huge one. Rather, only plan on providing power for the electronics you will need the most, such as your refrigerator, some lighting and any medical devices your family needs. There are two parts of the system’s capacity that you need to consider; the battery capacity and the charging capacity. In both cases we can generally say, “the more the better.” Your battery capacity will determine how much power you can use before your batteries go dead. Automotive batteries are rated in “reserve current.” This number refers to how much power they store. Multiply the reserve current by .4167 to find out the Amp-hours, which is the specification used for other types of batteries. One amp-hour is one amp of power for one hour. So, if we go back to our refrigerator example, which drew 5 amps, running it for one hour equals 5 amp hours of power. Keep in mind that to provide one amp-hour of power, the voltage inverter must draw 50 amp-hours of power from the batteries. So, a single 200 amp-hour battery will only run that refrigerator for two hours, before hitting the 50% charge level. The charging capacity of the system is the capacity of the solar panels, wind turbine or other power source you are using, as well as the maximum capacity of the charger. If you are using a typical automotive battery charger that plugs into house current, this would likely be six amps. So to get that 50 amp-hours of power into the battery would require 8.33 hours. By comparison, most solar panels are in the 80 to 100 watt range. But how do we convert that to amps, so that we can make a real comparison? To convert from watts to amps, divide by volts, which in this case, is 12 volts. So an 80 watt solar panel produces 6.67 amps of power, just a bit more than that automotive battery charger. What this means is that in order to run anything major, such as your refrigerator, you’ll need more than just one solar panel; you’ll need several. If all you’re going to do is charge phones and other small devices, one panel will probably do. But the more you want to do, the more panels you’ll need to have, in order to keep your batteries charged. 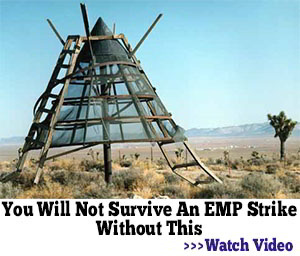 What’s the Best Fuel to Stockpile for Survival? I purchased my system by the piece for a SHTF scenario. 2 – 100 watt Renogy panels, solar charger and installation material from Amazon, I bought 2 of these kits for a total of 4. That gave me an extra controller, just in case. Because I decided to buy the second one later, it cost me $100 more than the 1st. Huge price increase within 2 months, but still just around $600 for both kits. I went to the auto store and bought all the wire and connectors I needed and 2 inverters from Amazon, 1- 2500-5000 peak and 1- 1500-3000 peak, just in case. I purchased 4 – US2000 – 220 amp hour 6 volt golf cart batteries to complete the system. Keep in mind, automotive batteries are rated for a sprint, used for short spurts of energy, golf cart batteries are built for a marathon. Also remember to house your batteries in a leak proof container and if in an enclosed area, always, ALWAYS vent that container to the outside so gasses can escape. I keep all the sensitive electronics wrapped in heavy duty foil and in a metal cabinet along with my radios and other equipment until we will need them. Above all else, think, do your research and be safe. Your family will need you. Instead of the low capacity cart batteries you cited, note that cart batteries are just Deep Cycle batts renamed for the golf community. Recommend instead 12 Volt Deep Cycle batteries which are available in large capacity models. They can be found at Walmart, Auto Stores, etc., for a good price. I have found 1,000 CCA Deep Cycle batts for around $100. A bank of them makes a great system. This has been one of the most informative (down to earth) articles on battery banks that I have read so far. It really breaks it down nicely and in “normal” easy to follow words. To clarify – you ran all the + to one bar and all the – to the other bar. Which one do you do first? Just to make sure I am going my math correctly – if you went with 4 solar panels at 80 watts each it would then only take you ~4 hours to recharge the 50 amps? If i recall, solar panels are rated in power at their VOC or open circuit voltage. A “12 volt” panel will have a VOC of typically 21 volts; thetefore a 100 watt panel will produce ~5 amps even at a down regulated 12 VDC. Interesting comment Farmer. I would like to know for sure on this. Does this 100 watt panel produced 5 amps or 8 amps at 12 volts? Big difference. I checked into this idea, and found you need a bit more to power a well pump…which is my main concern. I can read by candlelight, but I will need safe water. Be sure to check that your system can handle the well. I used to work at making Well Generators for Ranchers needing water for the cows. To drive a well pump, you first need to get the specs on the pump you need. Such as a 1/2 horse submerged pump, is pretty normal if the well is not too deep. You can go with 120 volt or 240 volt. For just a drinking well, a 1/2 horse pump should be sufficient. You would need to choose above ground, or if you have a well drilled, you could get a below water pump. The battery operated ones would not work as well as a small Generator. However, that would need a fuel type. Most come as Gasoline operated, but I changed them over to propane, as that is longer lasting, and starts in cold weather. 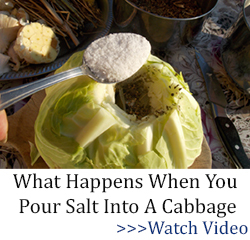 If this was to be for just survival, you would be better off to get close to a water source of some kind, then just collect the water from it and purify it by boiling after filtering with Cheesecloth or such. If it were for long time issues, you would then be wise to examine your resources, the availability of parts, items of use, needs of specific things. Like washing dishes and clothes, you don’t need sterile water for that. You can wash dishes in dirty water, then wipe them clean and either use boiling water, get some Clorox Bleach for purification, or use heat such as a campfire to make them pure. Clorox Bleach is a very good item. 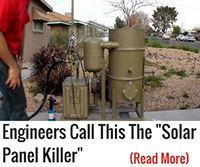 You can purify a 50-gallon drum of water with one capful. For an extended period of survival, one needs to delve into some information on things we really need. Many people will try to sell you magic “Kits” to cover all needs, but that is just for collecting money. Look things over real well, consider what is necessary, then work from there. If you wish more info look on Facebook for me as I am a redfoc007. This article has a number of errors. First of all, 3 12-volt batteries in series produces 36 volts, not 26. A 200 amp battery would be at 50% charge level after 100 amps, which is 2 hours at 50-amp hours, not 4. Four (4) hours would completely discharge the 200 amp-hour battery. Furthermore, general practice is not to let standard car batteries discharge below 80% and deep cycle (marine) batteries below 50%. Below these “safe”levels, the battery life is reduced. And all lead acid batteries will self discharge and needs to be topped off with a trickle charger or smart charger. Thank you so much. I corrected them. I have used old car batteries to run electric fencers/solar panels for decades. An old car battery is probably replaced because it wasn’t doing it’s job to start the car any longer. A battery will lose it’s reserve capacity due to repeated charge/drain cycles as a battery has a finite amount cycles in it’s life. Then you have individual cells in the battery that will go completely dead giving you a battery with less than 12 volts. For these reasons, old car batteries don’t make a reliable power reserve. Also, could one bad battery cell drain the whole bank? I don’t know…I’m asking. Than there is the Amp Hour issue. A battery is rated so many Amp. Hour based on a standardized 20 hour drain. Example… a 200 amp battery should give you 10 amps for 20 hours. It will not give you 50 amps for 4 hours because it needs time to “generate” the power. You may get only 2-2 1/2 hours with a 50 amp draw. A brand new well maintained battery also has a life span even if you don’t use it. I’ve been told it is around 10 years. I have a 175 watt panel with 2- 210 ah batteries for this purpose but it is an expensive insurance policy for something that I probably will never need. I wonder if a generator run by LP gas(unlimited lifespan) wouldn’t be a better more reliable investment? Dave, watt hours are comparable to amp hours…you just divide by your voltage to go from watts to amps and multiply your voltage if you’re going from amps to watts. Most car batteries in the States are rated in amp hours. One isn’t more accurate than the other…just a different measurement for the same end game. There are a lot of other details a person would need to know in order to use this system successfully. I.e., that mixing batteries of different age and remaining usefulness in parallel needs to be done with isolating circuitry, or the worst ones will negatively affect the best ones; and, charging lead-acid batteries in an un-ventilated area can result in explosions. The suggestions in the article are a good start, but if someone does this they should keep on educating themselves and be prepared to make changes to the system as they learn more. We have an error in our math here in this article. 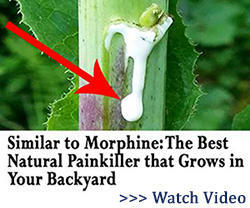 While it is not a death-defying issue, it should be corrected. These setups are not difficult. I had 4 Batteries parallel, keeping the input around 12 Volts, (21-23 at the Solar panel output reading,) where I had 2 16 inch panels, along with 6, 9 inch, (quite small, but all combined put in a good charge all day, even into the early night,) and an inverter putting out 120 volts. This would run my TV for at least 3 hours. I could watch movies, do my Computer, etc. It was not very expensive. I worked for a company for four years, where we built generators for rances. If anyone would need to set up a system, without too long a milage to travel, I would be willing to do it for a price. This would cover their “parts”, which I would suggest, along with my labor and travel expenses. I live in Billings Montana, so I could travel to them for maybe a day of work, and travel time. I have 12 batteries 6vdc each. I’m looking for a diagram on how to wire them together in series parallel for 24vdc. Imagine having 3 legs of batteries. Each leg has 4-6volt batteries connected in series to make 24 volts. Then connect the 3 individual legs in parallel to maintain the 24 volts. Rog, I could not locate you on the site I was on earlier for some reason. I got the Diagram set up for you on my Facebook. It should not be hard to find me there. Look for Redfox007, or Russell Palmer. It is public open. This needs (4) 6 volt batteries connected in Series to make 24 volts. Then connect another line of (4) 6 volt batteries in parallel with yet another line of (4) 6 volt Batteries again in parallel to these original ones. The parallel connections can be with cable, (#2 size is good,) connected from Battery #1 to #5 to #9 on each of the Positive and Negative posts. Next will be from #2 to #6 to # 10 the same way, followed with #3 to #7 to #11, and final parallel is from #4 to #8 to #12. 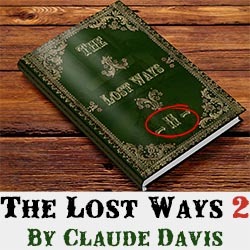 The inseries will need to be connected from the first line (#1,2,3,4) from Positive to negative, to positive to negative, to positive to negative, and positive to negative. Sounds confusing, but when you set them up it gets easier to see. I am on FaceBook, and if you can locate me I will post a diagram on this. Thanks for the image post on FB. All 12 battery are in a steel truck box. Currently in 2 rows. I’ll have to adjust the 3 rows to 2. I’m moving the whole of the system this weekend so when I can, I’ll rewired it. System consists of 7 – 300watt panels wired into a controller and dump load. I’m planning to get a new 24v controller with a wind input. Roj, that should not be a problem. The battery arrangement is not an issue, just keep the wiring in order. Jay, 12 Volt system is a little different than most, but nowadays they have 12 Volt LED lights, which you can get halogen containers for so they show a lots better light with less power usage. I am not sure what the appliances would take, but you can always get the lesser costly inverters for them and not interrupt the rest of the system. 12 Volts will draw more amps if you use anything of a high power. OMG, there are so many issues with this setup. Mixing battery types, ages, and sizes is a huge No-No in the battery bank arena. Car batteries prefer to live in the top 95% of their State-of-Charge. They are NOT designed for this type of service. Even “Deep Cycle” RV batteries do not like going below about 70% State-of-Charge….doing so dramatically shortens life. You can take a car battery down to 10% SOC maybe five times (if you promptly charge it right back up). An RV battery, maybe ten times. A gel cell (promptly recharged afterward) can come back up to 200 times. Sure, they cost twice as much, but they deliver many more charge cycles than their lead-acid examples. Cheap inverters are……cheaply made. Don’t waste your money. Invest in a durable, well-engineered inverter made by Magnum, Schneider, Outback, etc. I can see why this author says alternative power systems are unreliable. Better yet, use forklift batteries (one will likely serve you quite well). These industrial batteries will last many decades, but they do require watering from time to time. Most serious alt power systems run on 24, 36, or 48 volt battery banks.